French gangsters had a word for the events leading up to death by guillotine. They called it la ceremonie. Claude Chabrol's icy, ruthless new film is also about ceremony -- about the patterns of life that divide a rich French family and their strange new housekeeper. Unlike most ceremonies, it ends with an unexpected outcome. The film opens with Catherine, a pleasant, cultured French art dealer of a certain age (Jacqueline Bisset) interviewing a new housekeeper named Sophie (Sandrine Bonnaire). She explains the job: She lives with her husband and children in an isolated rural district, but Sophie will be free to visit the town from time to time. Sophie agrees, and presents a letter of recommendation from her previous employer. There is something subtly wrong about the way Sophie does this; we feel it but don't understand it. We meet the rest of the family: The father Georges (Jean-Pierre Cassel), the attractive 20ish daughter Melinda (Virginie Ledoyen), the younger son Gilles (Valentin Merlet). They live in an elegant, but not ostentatious, country house, furnished in good taste, with many books and artworks; the wintry classical music on the soundtrack sets the mood. Sophie is an excellent housekeeper, but not much company. She stays to herself in her room, staring impassively at the TV. The family agrees, "So far, she's been wonderful." They offer to let her drive the car into town, but she cannot drive. They offer driving lessons, but she says she cannot see well. They offer an eye exam, but she avoids the appointment and buys some cheap ready-made glasses as a cover. One day when the husband calls home asking about a file on his desk, Sophie hangs up the phone and pretends they were disconnected. We guess her secret before the family does. One day in town she buys some chocolates and presents a 100-franc note. "Do you have any change?" asks the clerk. "No," says Sophie. "Yes, you do!" says the clerk, rudely snatching her purse and counting out the coins. (The scene helps establish the film's view of class; the bourgeoisie shopkeeper would do that with a servant girl, but never with a middle-class customer.) By now we know Sophie cannot read or count; she is illiterate or dyslexic. Sophie makes a friend in the village who can read all too well: The postmistress, Jeanne (Isabelle Huppert), who opens all of Georges' mail. He hates her. She returns the feeling. Sophie and Jeanne become fast friends, and learn things about each other. Jeanne was once charged with killing her retarded child, but explains to Sophie, "It's not true... she killed herself... there's no proof..." Jeanne teases Sophie: "I know something about you..." She produces a newspaper clipping linking Sophie to a fire that killed 15 people. Once again, there was no proof. The two women hug each other with delight and collapse on the bed, giggling like conspirators. It is the scariest moment in the movie. Now all of the elements are in place: Sophie's deep vulnerability, Jeanne's ability to instigate, the growing resentment of the women toward the family. Only the family seems oblivious; life for them seems so refined and orderly, as they settle down for an evening of watching Mozart on television. Claude Chabrol has made about 50 films since 1958, when he was one of the figures in the French New Wave. Most of them involve crime, all of them involve pathological or obsessive behavior, and the number of them worth seeing is impressive. 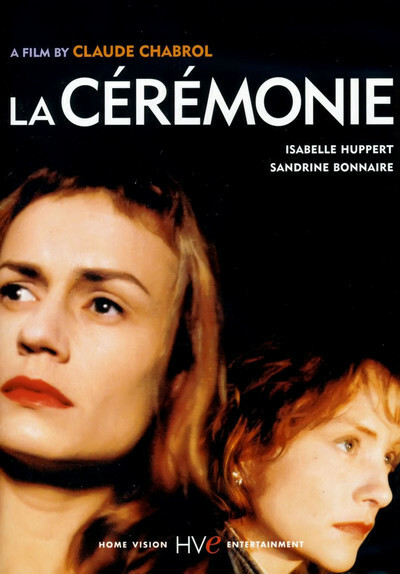 "La Ceremonie," he has said, is a Marxist film about class struggle, but perhaps it is more of a Freudian film, about the scarcely repressed sexuality of Jeanne and Sophie, and the ways it is expressed against a family that represents for both of them a hated authority. Watching the film, you think maybe you know where it's headed. Or maybe not. Not every ceremony ends in the way we anticipate. (Who would guess, never having attended a mass, that flesh and blood are consumed? -- And not just symbolically, according to believers.) Certainly from the family's point of view its opera has an unexpected outcome. The actors include old hands who have worked with Chabrol before (Huppert was unforgettable in his "Violette Noizerre") and strike the right note: No one in this movie should act as if he knows how it ends. And no one does.